★ We're only a few days away from the release of KINGDOM HEARTS III! Countdown till the big day with these daily quests! Countdown with us! The long-awaited KINGDOM HEARTS III is almost here! In order to celebrate its upcoming release, we will have daily quests for the next 5 days, for a total of 5 daily quests! 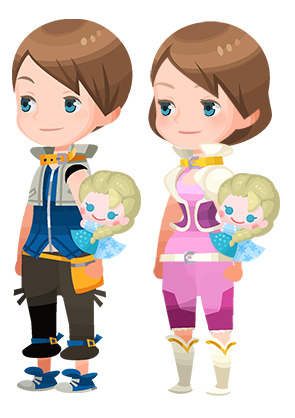 Complete objectives to earn rewards, including the Elsa Snuggly (Item Drop Perk +3) avatar parts on the final day! Please see the below for a list of adjustments implemented on Jan. 24, 2019 12:00 a.m. (PT) / 8:00 (UTC). ■ The following quests no longer require AP to play. ■ Adjustments have been made to AP costs of all other event quests. ■ Raid Bosses will only appear for Raid Events. ・Adjustments to Raid Event times and AP costs are planned for Raid Events held after Feb. 1, 2019. We would like to kindly remind our players that sharing accounts is forbidden by the game's User Agreement. The sharing of accounts can give players an unfair advantage, and we take these and other cheating violations very seriously. Violations may result in the account being shared being banned from rankings or in other actions taken against the account without notice, so please exercise caution with your account. See here for the User Agreement. We are happy to announce that Proud Mode Quests up to Quest 775 will be available as of Jan. 24, 2019 12:00 a.m. (PT) / 8:00 (UTC)! Changes Coming to Chasm of Challenges! ★ The Chasm of Challenges is being revamped! The Chasm of Challenges is being revamped on Jan. 24, 2019 12:00 a.m. (PT) / 8:00 (UTC)! The update will bring in brand new quests, meaning the current quests will be no longer playable. If you haven't taken on these quests yet, you may want to try them out before they leave!